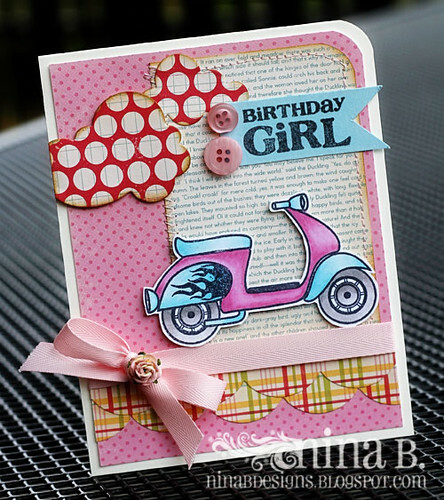 Crafting in Croatia: Birthday Girl Vespa, Winners and a little peek! I hope you had a great weekend. We had some rain here with chilly winds. It was a perfect paper crafting kind of weather :). I have a girly card for you today and my girls totally love it. I used the Vespa scooter from my new TCM Vintage Rides stamps for this card. I colored it with Copics. I just love these happy papers from October Afternoon's Sidewalks collection. I die cut some scalloped borders using Spellbinders Edgeabilities dies and layere them here. . Yes I do recognise the lady stamp - from your banner!! Love the card and the way you have cut the clouds from the dp. 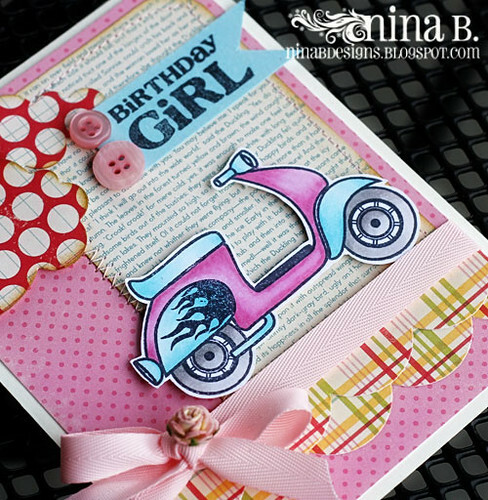 Love this card Nina - the Vespa is adorable! What a gorgeous scene you have created!! Oh this card is so fun and fabulously girlie! Such a sweet card Nina! Love that lady stamp and beautiful new set my friend.. Looking forward to seeing when it will be available to order. Congrats to the winners of the blog hop!! such a cute card. Love the design, the layered papers and the cheerful colors! Love your sweet card, Nina! And congratulations to the winners!! Adorable card today! I recognize the lady from your blog banner. Congrats!! Why yes, yes I do recognize that stamp! So exciting!!! Waiting to see what will be revealed next! Wow, what a fabulous card. Gorgeous card! Love all the bright colors! Congrats on the new stamps over at Penny Black ... looks just like your blog header! So excited that I won the "Thanks Be to Thee" stamp set. TY!